Photo credit: Adapted by WhoWhatWhy from Joseph Ferdinand Keppler / Library of Congress and Gage Skidmore / Flickr (CC BY-SA 2.0). 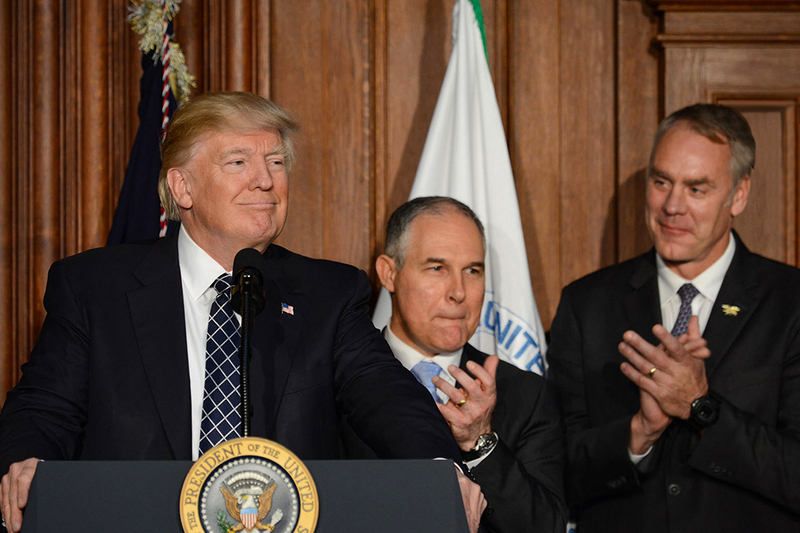 Forget the Environmental Protection Agency where Administrator Scott Pruitt is doing all he can to roll back Obama-era environmental regulations, and the Department of the Interior, where Secretary Ryan Zinke is freeing up millions of acres of public land for mining and oil drilling. The federal agency most under the industry-friendly sway of the Trump White House may be the Consumer Financial Protection Bureau (CFPB). 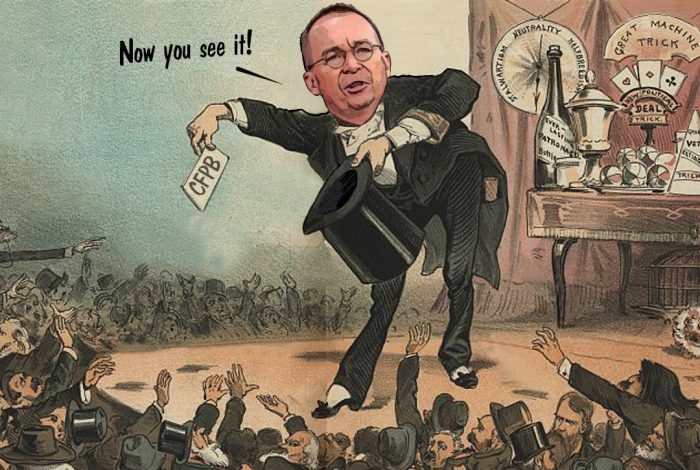 Like Pruitt and Zinke, its acting director, Mick Mulvaney, has little love for the agency he oversees, and has made the bureau a much tamer consumer watchdog. But Mulvaney seems to want to do more than change the agency’s direction. He wants to fundamentally alter its structure — or make it disappear altogether. “Please take my power away,” Mulvaney begged senators at a hearing earlier this month. Mulvaney, who as a member of Congress, called the bureau “a sick, sad joke,” made his goal clear. “You could protect consumers without me being here,” he testified. Mulvaney appears to be showing Democrats, who successfully pushed for the creation of the CFPB, what that agency looks like when its leader does not agree with a pro-consumer agenda. In 2010, Elizabeth Warren, then a Harvard law professor known for her pro-consumer views, was the driving force behind the creation of the agency, and its structure: It is led by a director, confirmed by the Senate, serving a fixed term of five years who can only be fired by the president for just cause, and supported by funds coming not from Congress but from the Federal Reserve. The agency was created to protect the public from predatory lenders, unscrupulous credit card companies, and other financial institutions that betray consumers. It was part of the package of reforms enacted after the financial crisis of 2008, driven in part by abuses in mortgage lending, which caused the stock market to plummet, millions of Americans to lose their homes and/or jobs, and such instability in the financial markets that it required a multibillion-dollar federal bailout of banks, investment firms, and automakers. Since its inception, the bureau has addressed 1.2 million consumer complaints, and returned nearly $12 billion to 29 million consumers cheated by banks and other lenders. That’s pretty much stopped since Mulvaney came on board. Mulvaney was suddenly dropped into the post after director Richard Cordray resigned last November, and named his deputy, Leandra English, to succeed him. That move did not sit well with President Donald Trump, who claimed that he had the power to appoint an interim director and named Mulvaney, the director of the Office of Management and Budget (OMB) to head the bureau. English sued, arguing that the position was rightfully hers. The US Court of Appeals for the DC Circuit is reviewing the dispute, and has raised questions about the legitimacy of Mulvaney being OMB head — and thus part of the White House — while also serving as acting director of an independent agency. Despite the controversy, Mulvaney has pursued his vision. According to the Associated Press, in his five months on the job the bureau has initiated no enforcement actions against any company — a tectonic shift in the enforcement practices of a bureau which over the past five years has required corporations to pay nearly $4 billion to consumers they had cheated or misled. About 25 cases, filed before he became director, are proceeding, Mulvaney said. Granted, the CFPB last week joined with another federal regulator to fine Wells Fargo $1 billion for mortgage and car loan abuses, but consumer advocates say that the action reflects how many consumers the bank cheated — 27,000 consumers had their vehicles repossessed — and the extent of the harm it caused them, not Mulvaney’s zeal for consumer protection. For Wells Fargo, the fine is “the cost of doing business,” Ed Mierzwinski, US PIRG’s senior director of federal consumer programs, told WhoWhatWhy. The Trump tax cuts, he added, could annually save the bank up to $4 billion or $5 billion. 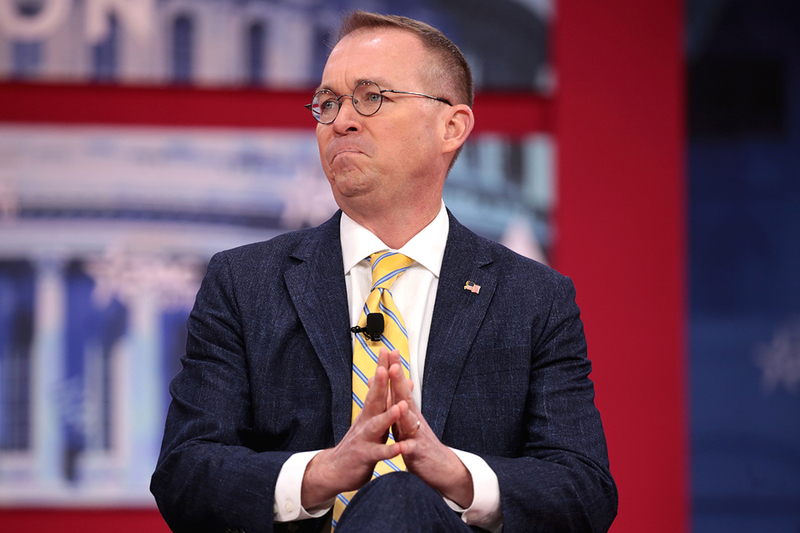 And when it comes to payday lenders, who often trap low-income consumers in an endless cycle of costly loan repayments, Mulvaney seems downright merciful. He has withdrawn at least one lawsuit against a payday lender, and appears to be slow-walking investigations and lawsuits against several others. Mulvaney, who as a congressman received nearly $60,000 in campaign contributions from payday lenders, is also reconsidering a rule that would require these companies to assess whether a borrower is able to repay the loan. While not revealing whether he will try to kill the rule altogether after he reviews it, he did concede that he may “draw a different conclusion” than Cordray. Indeed, he suggested that payday lending might be something the states should address, not his bureau, implying that the bureau may not actually have the authority to act. Mulvaney sees a distinction between “supervising” an industry and “regulating” it, and he isn’t sure that his bureau has the power to regulate. Mulvaney also has put the brakes on the bureau’s consumer data collection, citing concerns about the security of consumer information, even though that information — consumer advocates say — is crucial to spotting patterns of behavior by financial institutions and lenders that signal problems. And he hinted that the consumer complaint database, which now is searchable and accessible to the public, may go dark. “The law mandates collection of data,” he told senators, but the “public portion of a consumer-facing database” is not required by statute. Mulvaney brought on eight political appointees to help him do less, and he pays them well over $200,000 a year. When Democratic senators raised concerns about the high salaries, Mulvaney’s retort was to invite Congress to give him less money, less independence, more scrutiny, and more oversight. He urged them to make the bureau’s budget subject to Congress, which would fund the bureau through annual spending bills. “Please put me on appropriations. Seriously,” he told them. “I can walk down to the Federal Reserve and they will give me $700 million. I don’t have to tell you what I’ll do with it,” Mulvaney testified. 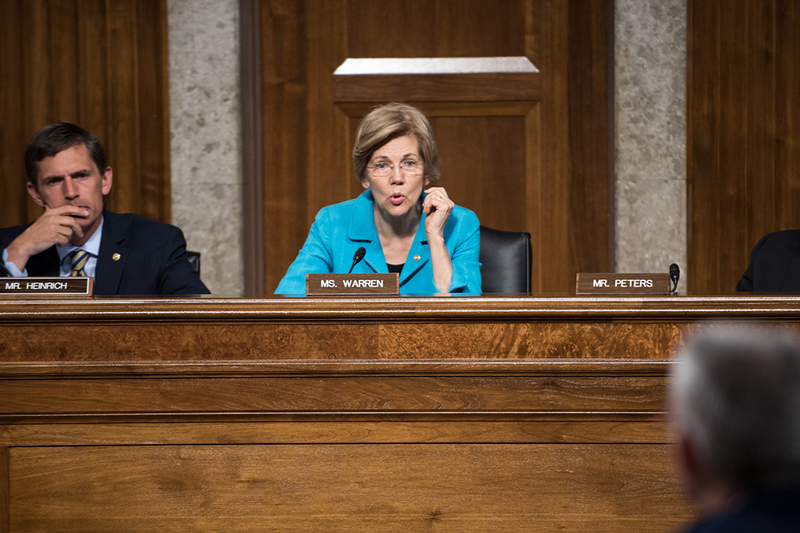 Warren, now a Democratic senator from Massachusetts, seemed to be so infuriated by Mulvaney’s attitude toward the agency that she attended the hearing only long enough to read a blistering statement, and then left. Appearing to take a page from the film It’s A Wonderful Life, she described what would have happened to consumers if the CFPB had not been on the job since 2011, making the point that other federal agencies, like the Office of the Comptroller of the Currency (OCC), and the Federal Trade Commission (FTC) have been slow to protect consumers. Citibank would not have been required to pay $700 million to customers it had deceived; unscrupulous firms would not have been punished for scamming 9-11 first responders, and shady lenders would have continued to prey on soldiers who applied for auto loans. She brought the father of one of the soldiers who’d been cheated to the hearing. “You are hurting real people to score cheap political points,” she charged. But if this is Mulvaney’s strategy, it may backfire. Republicans are so pleased with the CFPB’s new approach, they may be less likely to push for structural change. Rep. Jeb Hensarling (R-TX), long a critic of the bureau, seems less zealous about weakening it now. “Right now, I’m very happy,” Hensarling told the New York Times. Consumer advocates also are unmoved. “We still stick by a single director,” Mierzwinski asserted, adding that Mulvaney cannot undo what Cordray achieved, since repealing a rule must follow the same procedures — including allowing for public comment — as proposing one, and a director can be sued if he tries any shortcuts. Related front page panorama photo credit: Adapted by WhoWhatWhy from windows (Ellen Forsyth / Flickr – CC BY-SA 2.0).